Motley Crue are reportedly being sued by a pair of photographers over merchandise sold during the band’s lengthy two-year farewell tour. According to TMZ, Barry Levine and Neil Zlozower filed a lawsuit in New York on Tuesday seeking compensation, damages and attorney’s fees after images they both shot of the band were used on a variety of merchandise without their permission. "In the 1980s,” states the suit, “Zlozower and Levine photographed the members of the Motley Crue band at Zlozower and Levine's respective studios in Los Angeles. Zlozower and Levine used their own cameras, lighting equipment, film, batteries, backdrops, and accessories. Zlozower and Levine directed the band members as to where to stand, how to pose, and where to position. "Defendants infringed Plaintiff's copyright in the Photographs by reproducing, publicly displaying, and selling the Photographs on merchandise. Defendants are not, and have never been, licensed or otherwise authorized to reproduce, publicly display, distribute, sell and/or use the Photographs on merchandise." 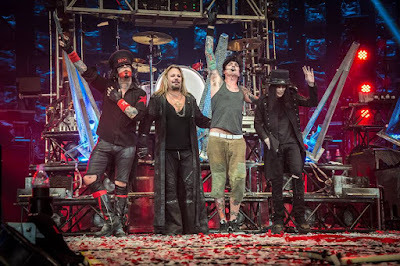 Among those named as Defendants in the case are Motley Crue and associated companies including Motley Touring, Global Inc., Global Ltd., Live Worldwide, Live Concerts, Live Entertainment, and Live Merchandise.